Get a FREE home inspection & 10% OFF! Effective pest control that’s safe for kids, pets—and the environment! 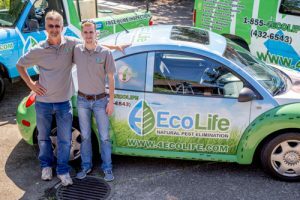 From ants to termites, rodents, even dry rot problems, the EcoLife team doesn't just eliminate pests; we prevent them from returning using effective, natural solutions. Offer valid on your first EcoLife Pest Elimination Service. Not valid with any other offers. Request a Free Home Inspection Today! We’ll take a look inside and out to uncover whatever your pest problem consists of and what potential problems may be lurking. Get a FREE inspection, 10% OFF your first service, and a consultation just by filling out the form! We’re local, family-owned & operated and we’re dedicated to our neighbors! As an Oregon family business, we know the customers we serve are our neighbors so integrity, honesty and superior service are always at the top of our priorities. We’re here to make you happy. Our experienced and skilled exterminators will customize treatments to exactly meet your needs for pest elimination in Western Oregon. Simply Natural Solutions is our exclusive line of natural pest elimination products, providing your family with effective, safe and long-lasting pest solutions. All of our products are made from essential oils, botanical oils, and natural inorganic materials. Trust in the best for your family, children & pets!